50 kilometres off Delhi. Posh multi-storey apartments spread over 25 acres. 2700 residential units. Gate-guard-CCTV cameras. Mahagun Moderne society. 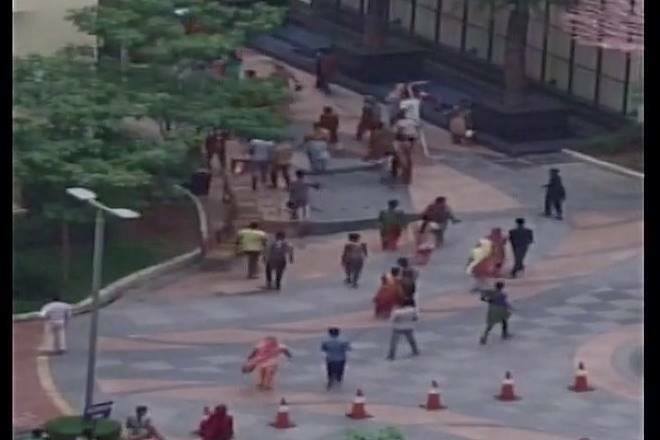 Early in the morning on 12 July 2017, a mob, led by hundreds of women doing domestic work, collected from illegal slums surrounding the apartment complex and stormed into Mahagun Moderne. Stones, sticks, iron rods. Riots. Armed police personnel arrived in four trucks. Zohra, a worker, had been demanding outstanding dues of Rs 3500 for the past 2 months. On the evening of 11 July, her employer accused her of stealing and shut her up in a room. When Zohra's husband went to Mahagun Moderne society at night to search for her, he was told that she was not there. He came back with policemen, and they were again told that Zohra was not in the society. Discussions during nighttime among the the women doing sweeping, laundering, cooking-serving-dish washing work in the society and men doing construction work, etc. living in the slums. At 4 in the morning, women from the slums started collecting outside the gates of Mahagun Moderne. The crowd swelled. Commotion. Guards brought a semi-conscious Zohra from inside the society. one resident said she alongwith her husband and son hid in the bathroom for an hour and a half to save her life. on 13 July, the residents decided to bar all domestic workers from entering the society. Many families ordered food from outside. “The point is that they must be taught a lesson ...If they can unite, why can’t we?” - a resident of the society. Another said she woke up an hour early. Planning to buy “a wiper which is made with new-age technology” for cleaning. “They are like a bone stuck in our throats — can’t be swallowed, can’t be spat out" - another resident. It is necessary to be vigilant. “They tried to show that they did not have rights. I feel that we do not have any human rights. We are the poor ones,” said another from the housing complex. “I think they hate us. There is a definite class divide. They hate us for our money." Noida’s superintendent of police: "it was striking how quickly the homeowners had turned on their employees, accusing them falsely.."
The police arrested 78 workers on the night of 12 July. None of the residents of the society had suffered as much as a scratch, yet, 13 of the workers were charged with attempt to murder. And, a union minister came to Mahagun Moderne for a meeting with the residents of the societies of that area. Assuring the residents of their safety, the minister said that the 13 arrested workers "will not get bail for years to come". Instead of sitting on the floor, domestic workers now sit on sofas. They sit on chairs even while their employers are around. Riddle: Why is it that the poor don't kill the rich? Mobile phone company, Vivo India which was the official sponsor for this year's IPL (cricket tournament business), has a manufacturing unit at the World Trade Center in Greater Noida. Vivo India has bought the title-sponsorship of IPL for the next five years for Rs 22 billion. Vivo is the sponsor for the Pro Kabaddi (a sport) league as well. Demand for Vivo phones fell after the IPL season. A majority of the fifteen thousand workers assembling the mobile handsets are temporary workers. Production line workers are paid a monthly salary of Rs 7000 ($109). As per policy, the company started sacking workers. 500-1000 workers had been fired and there were talks to fire 2000 more workers. On 25 July, at 8 in the morning, 20 workers who had come to the factory for duty were made to sit in the tea area for settling their dues. During lunch break, another 100 temporary workers reached the spot. All of a sudden, the workers rebelled. Windows were broken. Cellphone assembly units were demolished. The terrorised management called the police. Additional guards were rushed in from security companies. Six workers were arrested and the company put up a notice suspending operations on 26 July. 1) The violence happened because of a misunderstanding. The workers were not being sacked, they were only being sent to another section for training. "The workers confused 'move' with 'remove'". 2) It is the company's policy to sack workers to maintain and improve productivity. Shaken by the workers' revolt, the Vivo management, along with representatives of the embassy of the People’s Republic of China, met police officials in the district. The police assured them of safety and asked the company to inform the police in advance about its retrenchment plans, so that the police can be vigilant in preventing a repeat of 25 July. On 26 July, workers of Majestic Auto's factory in Greater Noida stopped production protesting the sacking of 8 workers by the management. 2500 workers of Priyagold biscuit factory at Surajpur rebelled on 29 June at 8pm. Police personnel came to the factory in over 20 vehicles to control the workers. On the following day, 30 June, the workers did not go to the factory. Workers upsurge was seen in March 2017 in the Oppo mobile factory in Noida. Three thousand workers of Orient Craft garment factory at Noida, Sector-63 revolted on 1 October 2016. Forces from many police stations had to be called to control the workers. 180 million mobile handsets are manufactured annually in the Noida-Greater Noida area in nearly 25 factories such as Samsung, Lava, Intex, Oppo, Vivo, etc. Companies are extremely worried over the increasing revolts of workers in the region. The India head of a mobile company said that a meeting of prominent mobile handset manufacturers in Noida-Greater Noida is being planned to draw up strategies to deal with the rebellions. Translated from the August 2017 issue of Faridabad Majdoor Samachar. "the violence happened because of a misunderstanding. The workers were not being sacked, they were only being sent to another section for training. "The workers confused 'move' with 'remove'.... it is the company's policy to sack workers to maintain and improve productivity." A confused Vivo India management. Those three statements neatly sum up much of the content of middle class Asian life. What must first be called out is the Great Indian Middle Class' shocking lack of empathy for the poor and zero awareness of their rights. People expect maids to clean up after them but do not consider it clean for the domestic worker to use their toilets. When young girls are rescued from homes where they are beaten and not paid wages, employers are often surprised at what the fuss is about. They still believe they are doing the domestic workers a favour by giving them scraps of leftover food and shelter. Years ago, when I lived in a housing society in Mayur Vihar, east Delhi, I ended up breaking a friendship after a young girl from Jharkhand was working in a house where she did not get wages for three months because they thought she was stupid and ill-trained and, anyway, they were feeding her. The girl's aunt worked with me, hence I forced them to pay up and shifted her to my house. The great irony is that the friend who feigned ignorance about how his wife and parents treated the girl was a professional musician with pretensions to being radical: the kind of guy who would wear Bob Marley and John Lennon t-shirts with slogans about freedom and justice. A truly pathetic specimen of the Indian middle class. The good part of the Mahagun Moderne story is domestic workers asserting their rights. It's unusual and they need to get more organised about naming and shaming employers who fail to meet minimum wage requirement, do not pay, maltreat or impinge on personal freedoms of those who work for them. I ruminate because the events at the Noida housing society called Mahagun Moderne started out as a class conflict protests over a domestic worker being allegedly locked up but has ended up with the same old Bangladeshi bogey. The society has now reportedly decided to ban Bangladeshi workers from entering the complex, and the slum cluster near Sector 78 Noida where many of them live is also being demolished. It's a safe way to end the entire matter for some of the self-righteous middle and upper class people although the good news is that some residents are protesting. Of course, the Bangladeshi tag can be used to disenfranchise Indian Muslims who happen to be Bengali speaking the maid who was locked up is reportedly from Cooch Behar, West Bengal while those who ill-treat the domestic worker get away scot-free. Discourse on class struggle has, for a large part since the 20th century, been around the critique of "classism" - belief system of the oppressing or "neutral" class of society. This really put the discourse on a moral platform, rather than on workers' power. Largely, critique of the former ruling classes was the content of justification for statist projects in Soviet Russia, China and so on. Similarly, a lot of expressions of class struggle are submerged in this critique of classism. Specifically, from those sections who get to write in leading newspapers and become voice of the civic conscience. Those who speak of "workers' rights" have little problems with wage-slavery. They would prefer a wage-slavery justified in legal terms as "rightful". Another aspect of this equation is, such voices are through and through national in their articulation. "Indian workers" "Indian ruling classes" "Indian middle classes" and so on. Can a worker be enfranchised to break his chains by national citizenship? What about the actually existing workers from Bangladesh (or Nepal or Ethiopia) who are working in India? A critique of the middle class is a doomed project, moreover, because today it's become a very unclear issue who that is. A large class of professionals are becoming workers. Not to dismiss it altogether, but foregrounding critique of classism has the effect of presenting workers as weak. Our hope is that we can make workers' power the guiding spirit of discourse. A critique of the middle class is a doomed project, moreover, because today it's become a very unclear issue who that is. The practice of the workers at Mahagun Moderne shows that it's not always a mere theoretical question and that the middle class indeed clearly exists and wields considerable power over many workers. Or was this posted as a supposed example of an internal conflict within the working class? To quote from the bourgeois press for informational purposes doesn't necessarily mean complete agreement with their views. We can assume that mosts readers here are able to interpret the mainstream press critically. If no one ever did so we probably wouldn't even know about the struggle at Mahagun Moderne. The extract you quoted is problematic in terms of perspective, and so in terms of information. If one's looking for rights, adherence to minimum wage, observance of legal stipulations... one's forced to admit workers are weak, or that "the middle class wields considerable power over many workers." These are criteria from a time when industrial production in these parts was less than miniscule compared to what it is today. Seen in the context of present day rural-urban dynamic, demands of capital globally, and so on, we don't refer to these useless parameters for understanding workers' strength. What you've presented as weakness of workers is actually the weakness of the current society's premises. If you see the managerial class as powerful, you will be appalled at the number of managers killing themselves, or the number of times "middle-class" people are forced to change their house-helps due to insubordination. Isn't their relation here as direct employers of the domestic workers (or maybe indirect via an agency). Obviously income/wealth is what gives them capacity to also be employers, and they may be getting that from middle class occupations, but not sure if you're a domestic worker it makes such a difference whether the person employing you is a 'professional' or CEO. The professional might have their own work issues with their own employer, their social position might allow them to employ domestic workers in the way a domestic worker obviously couldn't, but they need to act on that potential to actually become an employer and get into this directly antagonistic position.
" Obviously income/wealth is what gives them capacity to also be employers..."
Yes, but my question is, how can income/wealth or the means of production/exchange solely determine power? The managers/employers can exercise one form of power (upon the social desperation of the worker), but the worker too has means at her disposal? The extract you quoted is problematic in terms of perspective, and so in terms of information. If one's looking for rights, adherence to minimum wage, observance of legal stipulations... one's forced to admit workers are weak, or that "the middle class wields considerable power over many workers." These are criteria from a time when industrial production in these parts was less than miniscule compared to what it is today. I find your perspective problematic. If one recognises a class of workers one recognises an exploited class within class society - unless you have a strange definition of class and see class relations as free of exploitation? Most workers seek improvements in pay and conditions - they often seek it via class struggle. You seem to be claiming that m/c employers of domestic workers have no power over them - as if the selling of labour power is freely contracted and there is no exploitative class relation involved in that. As I said, I don't have to fully endorse a viewpoint to quote it as information so please quit labouring that point. The workers live in slums outside the m/c gated communities, they work for the m/c employers. The m/c themselves may take crap from employers or commercial competitors that stresses them even to the point of suicide on occasion. None of that invalidates the category of middle class or that there is a class relation present. Members of the ruling class also get stressed and even attacked by competitors for power, it doesn't mean they're not part of a dominant class. I don't see the point in somebody painstakingly belabouring the argument that workers are weak. How much workers are exploited is something that is also determined by resistance put up by workers. Not sure why you want to put it in such absolute terms. Simply pointing out the fact of class antagonism based on an exploitative relationship is not to labour that point at all or say that workers are only weak, that's your odd interpretation - though in the ebb and flow of class struggle they clearly sometimes are or there would be nothing to struggle about or gain strength for! I pointed out the exploitative antagonism only because you tried to play down the fact of class antagonism present in these events by saying some of these m/c employers are also exploited in their professional roles.